Why is there coal ash in the Middle Fork? How much coal ash is stored in the river’s floodplain? Are the coal ash pits lined? I’ve heard some people say coal ash is considered “non-hazardous”. How can they say that, if the chemicals in coal ash are so toxic? If coal ash chemicals are toxic, why did the U.S. EPA decide to regulate coal ash as a solid waste, rather than a hazardous waste? Can Dynegy-Midwest Generation reuse the coal ash at the Vermilion site? I’ve also heard that the coal ash is so safe that the Illinois Department of Natural Resources has used coal ash pits for rearing fish. Is coal ash polluting the groundwater? Have coal ash pollutants been entering the river? Aren’t the red stains on the bank present at other locations along the river? What about the New East Ash Pit? Is it leaking? Could a breach of the walls of one or more of the coal ash pits really happen? Won’t reinforcing the riverbank permanently stop the erosion? If the ash has been there for over 55 years, why should we be concerned now? What is Dynegy’s plan for dealing with the ash? Will covering the pits stop the groundwater pollution? What are the risks of leaving the ash in the floodplain? What would be the consequences of a coal ash spill? Are there any financial guarantees that taxpayers will not be saddled with long-term maintenance or clean up costs? How feasible is it to move the coal ash? Who has to approve Dynegy’s plan and what will it show? If the Middle Fork is a National Scenic River, wouldn’t the National Park Service want to see the ash removed? What is the timeline for IEPA approval of Dynegy’s plan? Will there be an opportunity for public comment? 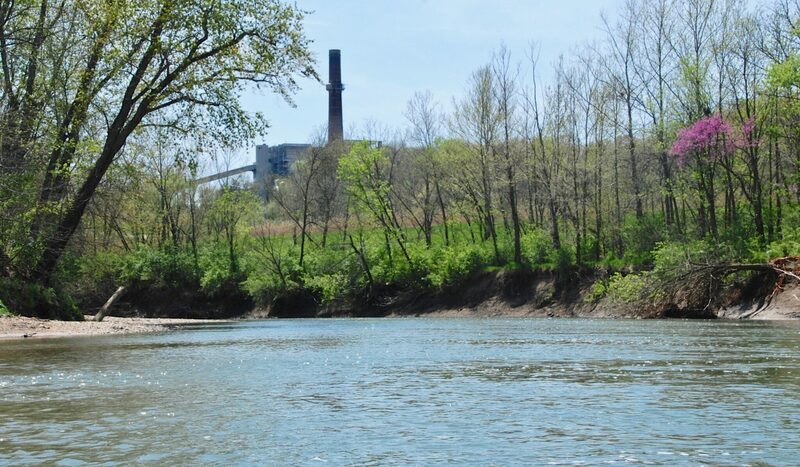 In 2011, Dynegy Midwest Generation closed its electric power station along the Middle Fork of the Vermilion River, Illinois’ only National Scenic River. The Middle Fork is one of the most biologically diverse streams in the Midwest and the centerpiece of a major recreational area in east-central Illinois. 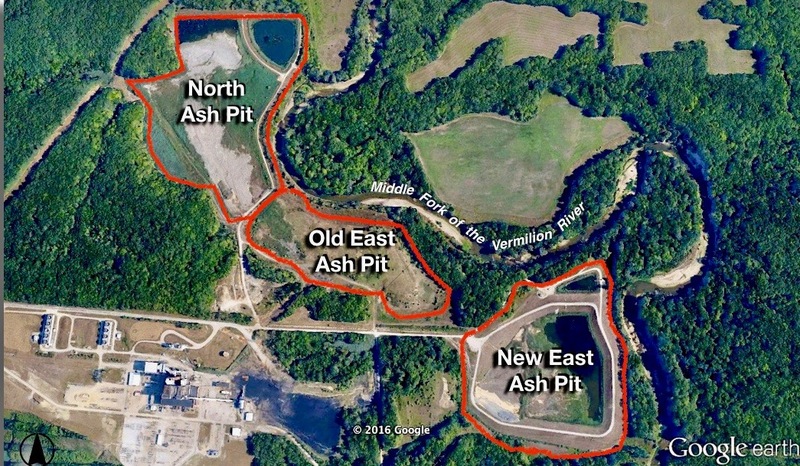 A proposal is now before the Illinois Environmental Protection Agency (IEPA) that could allow Dynegy to leave millions of cubic yards of toxic coal ash in three unlined pits located in the floodplain of the Middle Fork. 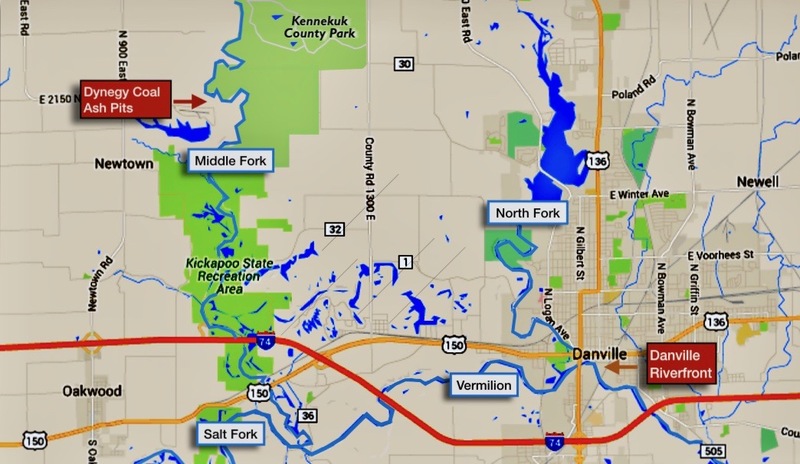 Location map showing relationship of Dynegy-Midwest Generation’s three coal ash pits to Kennekuk Cove County Park; Kickapoo State Recreation Area; and the City of Danville. Prepared by Eco-Justice Collaborative. 2016. Why is there coal ash in the floodplain of the Middle Fork? The Vermilion Power Generating Station, a coal-fired power plant, was built by Illinois Power along the west bank of the Middle Fork of the Vermilion River in 1956. Dynegy purchased the plant from Illinois Power in 2000, which it then operated until 2011. 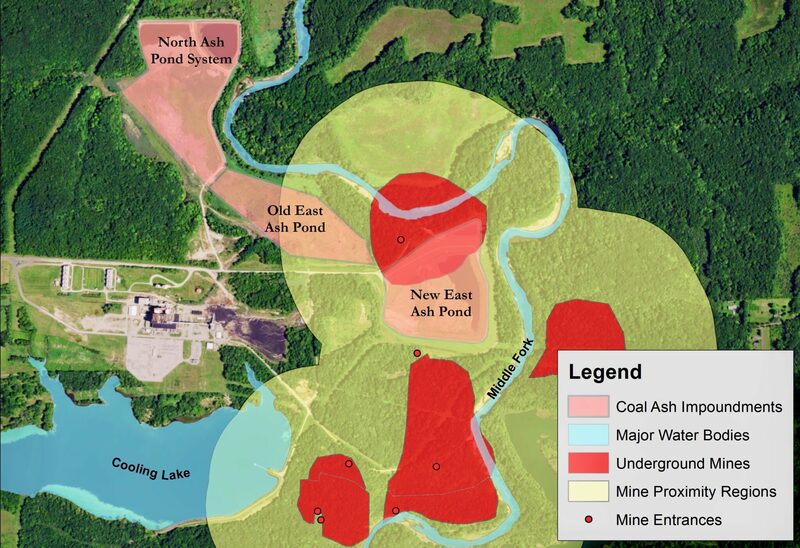 Image showing approximate boundaries of Dynegy’s coal ash pits was prepared by Eco-Justice Collaborative, 2016. The Vermilion Power Station is in the lower left corner of the graphic. Coal ash is made up of several waste streams including bottom ash (much like the ash from a fireplace), boiler slag (molten bottom ash that has turned into smooth glassy pellets), fly ash (fine, powdery material composed mostly of silica), and flue gas desulfurization material (waste produced as part of the process of removing sulfur dioxide emissions). Would fill Chicago’s Willis (Sears) Tower nearly two times! Historic mining activity in vicinity of Vermilion Power Station. Andrew Rehn, Prairie Rivers Network. June 2017. All three pits are unlined. The two oldest storage areas, the North Ash Pond and the Old East Ash Pond are leaking. The third, the New East Ash Pond, was constructed on top of the existing bedrock (shale). Although its sides are lined with clay and trenched into the bedrock (diked ring), it is not considered a lined facility by the U.S. EPA. Following the catastrophic coal ash spill in Kingston TN in 2008, the U.S. EPA was prompted to establish rules for regulating coal ash contamination. After many months of hearings and public proceedings, the U.S. EPA determined it would regulate coal ash as a solid waste under Section D of the Resource Conservation and Recovery Act (RCRA), as opposed to Section C of RCRA, which governs hazardous waste. This is a regulatory distinction, and does not mean that coal ash is either safe or non-hazardous. Coal ash is dangerous. After the dike gave way at TVA’s Kingston Fossil Plant, dumping 5 million cubic yards of sludge into the Emory River and across 300 acres of the Swan Pond community of Roane County, the U.S. EPA declared the area a superfund site full of toxic metals and chemicals. A variety of considerations entered into the U.S. EPA’s decision to regulate coal ash under Section D of RCRA. One was the enormous amount of coal ash that is produced in the U.S. each year (an estimated 140 million tons) and the practicality of handling this volume of material as a hazardous waste. Another was the reality that regulating coal ash under Section C could limit the potential to reuse or recycle certain portions of coal ash waste stream. This process is referred to as “Beneficial Use”. Dynegy has set a goal of reusing 100% of their newly-generated coal ash by 2020. Australian-based Nu-Rock Technology has proposed the construction of a manufacturing facility at Dynegy’s Baldwin plant in Randolph County, Illinois, in order to make building products out of coal ash. “We do not use coal ash ponds anywhere for fish rearing. Yes, coal ash is polluting the groundwater. Dynegy and the Illinois EPA have both documented groundwater contamination at the site. 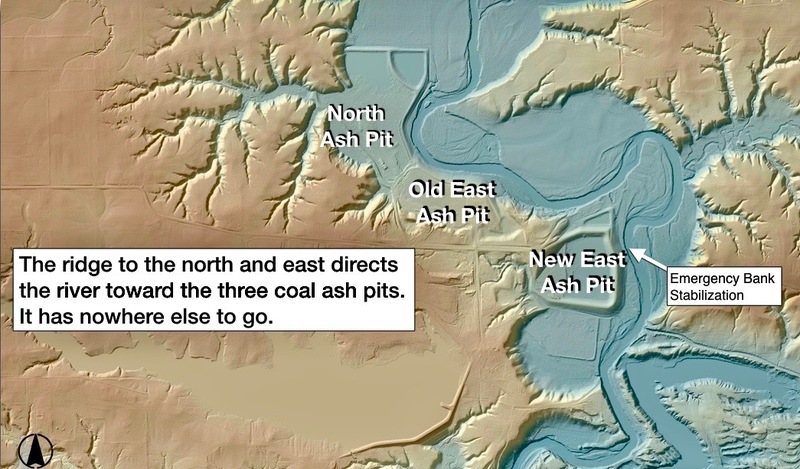 Over 2.8 million cubic yards of coal waste is stored in the two oldest unlined pits. Because these pits extend up to 44 feet below their surface, they come into contact with the groundwater. In 2010 and 2011, Dynegy’s own reporting showed these pits were contaminating groundwater (see page vi. and pages 45-46). The following July, the IEPA issued Dynegy-Midwest Generation a Notice of Violation of Class I Groundwater Standards for boron, manganese, sulfate, total dissolved solids, iron and pH. These chemicals are indicative of coal ash pollution. Seepage from the Old East Ash Pit into the Middle Fork of the Vermilion River. Photo taken from the river by Pam Richart, Eco-Justice Collaborative, June 2017. 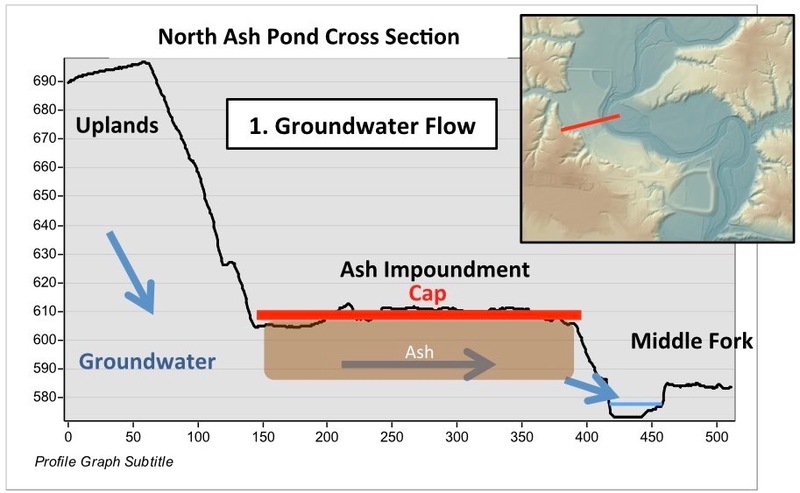 Water quality analysis confirmed this was ash seepage (leachate, i.e., groundwater entering the surface water), and that boron from seeps at the “lower pond” (the Old East Ash Pit) was present at about three times the chronic water quality standard. This seepage can only be seen from the river. Click here to watch a short video showing seeps actively leaching chemicals along the Old East Ash Pit. This film clip was taken by Eco-Justice Collaborative in June of 2017. 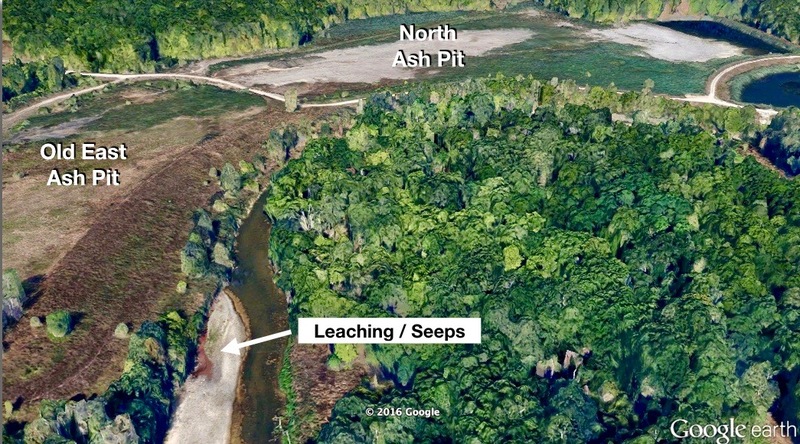 2016 Google Earth Map shows seeping from the Old East Ash Pit into the river channel. Yes, red stains can be found along the bank of the Middle Fork at other locations. They are primarily caused by the oxidation of iron seeping through the riverbank. However, this signature color on the riverbank that abuts Dynegy’s coal ash pits does not mean that only iron is present. The color is a clear indicator of constant seepage, and no other location along the Middle Fork has this extensive, year-round discoloration. 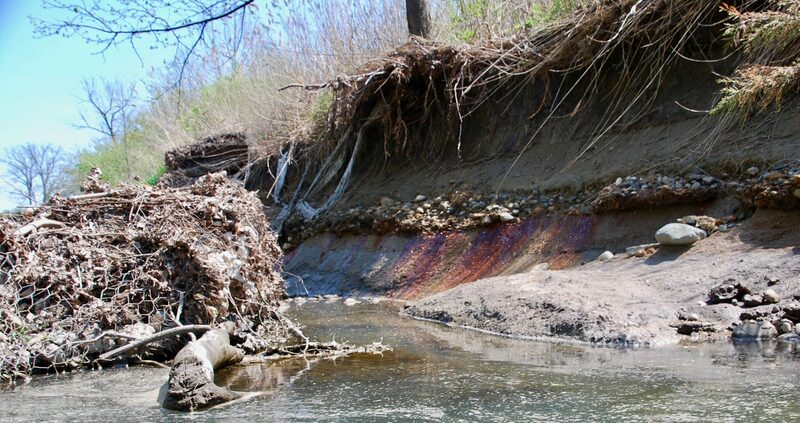 Photo shows seepage along the Old East Ash Pit into the Middle Fork of the Vermilion River. Photo taken from the river by Pam Richart, Eco-Justice Collaborative, April 2016 and June 2017. Coal ash spills have happened at multiple sites across the U.S. The two most catastrophic occurred at TVA’s Kingston Plant in 2008 and at Duke Energy’s Dan River Plant in 2014. The circumstances contributing to these and other spills are unique to each site. The bank abutting the New East Ash Pit eroded by 20 feet in just 6 years, requiring emergency riverbank stabilization in November 2016. Photograph by Pam Richart, Eco-Justice Collaborative, April, 2016. Key concerns at the Vermilion Station include the continuing erosion of the river channel toward the coal ash impoundments and the associated vulnerability of the embankments. Under the current federal coal ash rule, power plants must post maps showing the extent of inundation in the event of a coal ash spill. Because the Vermilion Station was closed before the federal rule became effective, Dynegy-Midwest Generation does not have to provide an inundation map for the Vermilion Station. This means we don’t know what the extent of a spill might be if one or more of the pits were breached - but we do know that coal ash could flow many miles downstream. What we also know is that Dynegy had to seek emergency approval from state and federal agencies to shore up the bank next to the New East Ash Pit in the fall of 2016. This was because the river had eroded as much as 20 feet of protective bank next to the ash pit in just six years. According to their own internal correspondence, Dynegy reported that at one location just 10 feet remained between the river and the toe of the slope of the New East Ash Pit, making failure a real possibility. 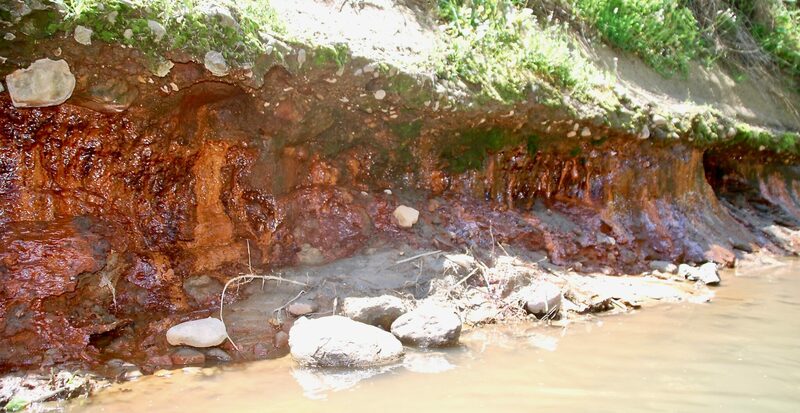 The erosion was so extensive that it also destroyed two monitoring wells. 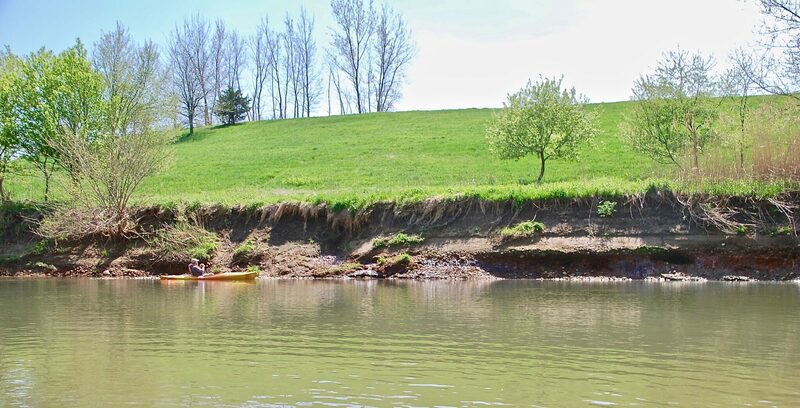 Severe riverbank erosion near the ash pits has been an ongoing problem for decades. Illinois Power installed gabions (wire cages with rocks) along the bank adjacent to the Old East and North Pits in the 1980s. But the gabions have been ripped away from the bank of the Middle Fork by the powerful forces of the river. This has left the riverbank vulnerable to erosion once again, and the wire mesh that now is located in the river’s channel (instead of on the bank) is a hazard for those who use the Middle Fork for recreation. Graphic overlay prepared by Eco-Justice Collaborative in 2016 using Lidar image, Illinois Geospatial Clearinghouse, Prairie Research Institute, University of Illinois. Dynegy-Midwest Generation closed the Vermilion Power Station in 2011 and now is seeking IEPA approval for closing its three coal ash pits. This includes addressing coal ash pollution from the two older pits that are known to be leaking. But the IEPA also is requiring Dynegy to show how they intend to prevent a breach in the walls of one or more of the impoundments that could spill coal ash waste into the river. We don’t yet know Dynegy’s final proposal for closing its three pits, since they are currently revising their plans to address prior IEPA comments. However, previous proposals have called for covering the coal ash with an impermeable cap and leaving it in the floodplain of the Middle Fork. Dynegy hopes that federal and state agencies will also approve bank stabilization similar to that put in place along the New East Ash Pit as part of their “cap and leave in place” plan. Capping the coal ash will reduce the infiltration of rainwater and floodwaters into the ash from above. However, covering the pits will not separate the ash from the groundwater, nor prevent the lateral flow of groundwater through the ash from the west toward the river. The Middle Fork of the Vermilion River, Illinois’ only National Scenic River, is one of the most biologically diverse rivers in Illinois. The river supports 57 different species of fish and is surrounded by a public open space corridor that is heavily used for hiking, photography, wildlife viewing, horseback riding, camping, and paddling. 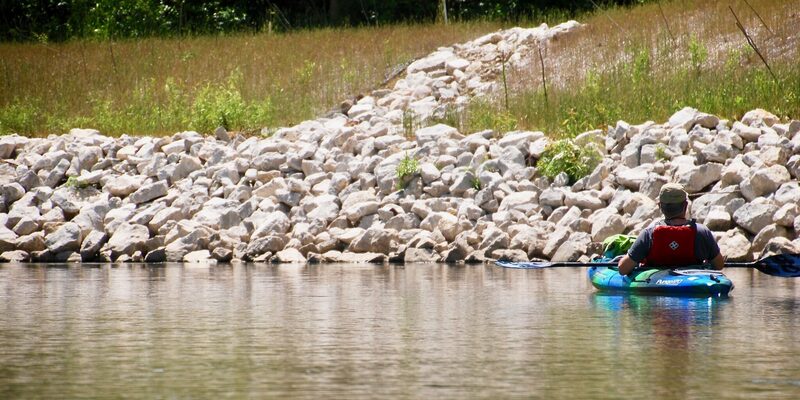 Kickapoo State Recreation Area alone serves 1.5 to 2 million visitors every year, and over 10,000 people canoe, kayak, or tube the river annually during warm-weather months. Tubing on the Middle Fork. More than 10,000 people kayak, canoe, or tube the river every year. Photo by Pam Richart, Eco-Justice Collaborative. August 2014. 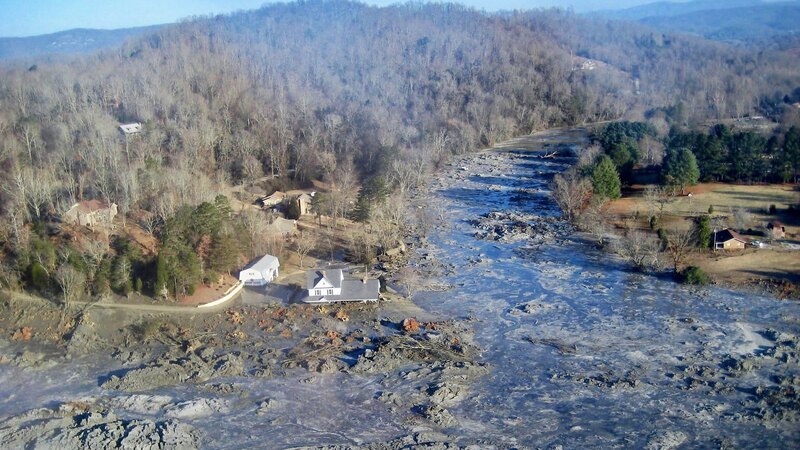 The release of over five million cubic yards of coal ash from the Tennessee Valley Authority’s Kingston facility in December 2008 flooded more than 300 acres of land, damaging homes and property. So far, the cost of clean-up is $1.2 billion and mounting. In 2014, a Duke Energy plant in NC sent 46,000 cubic yards of toxic coal ash into the Dan River polluting the river over 70 miles downstream. The volume of this spill is comparable to about 1.3% of the volume of ash stored in Dynegy’s three pits. And the bill for full cleanup of the N.C. spill has been estimated to be over $300 million. These costs included harm to the environment; lost recreational opportunities; injuries to human health; reduced use of the river as a source of food; and the river’s diminished aesthetic value. These spills should serve as a wake-up call for diligence on coal combustion waste disposal units in Vermilion County. Duke Energy is currently relocating its coal ash to lined facilities at its plants in Asheville, NC, Mooresville, NC, Eden NC, Wilmington, NC, Mount Holly NC, and Belton, SC, and has announced plans to move ash at four other basins in Goldsboro, NC. Georgia Power is removing ash from 17 ponds located next to lakes or rivers in Georgia. In a recent court decision, the Tennessee Valley Authority was ordered to remove ash at its Gallatin, TN plant and place it in a lined facility that would not pollute adjacent surface and groundwaters. As a result of its Notice of Violation of Class I groundwater standards, Dynegy is required to submit a Corrective Action Plan to the IEPA for their review and approval. The Plan must document how Dynegy will bring the site back into regulatory compliance. The National Park Service explained in their Evaluation and Determination Letter they believed the emergency riverbank stabilization project requested by Dynegy was necessary “until such time the fly ash storage ponds are removed.” But they also stated that the pits present a water quality hazard and obstruction to the free-flowing conditions of the Middle Fork. Their recommendation is to remove and relocate all the coal ash. On page 10 of their Evaluation and Determination letter, the National Park Service further states that the riverbank stabilization project does not protect or enhance the Middle Fork of the Vermilion River or its values to the greatest extent possible, and concludes that it is not consistent with Section 10(a) of The Wild and Scenic Rivers Act. The Old East Ash Pit rises above the river interrupting the otherwise natural, scenic character of the Middle Fork. Photo by Pam Richart, Eco-Justice Collaborative. April 2016. The Middle Fork derives its scenic quality from its forests, tall bluffs and largely undeveloped riverbanks. Few buildings are visible from the river, except for the power plant’s smokestack and the pump house further downstream. The deteriorated gabions along the riverbanks of the two oldest pits; the exposed “rip-rap” that now lines the newly installed stabilization along the New East Ash Pit; and the towering, grassy embankments that form the walls of the three ash pits stand in sharp contrast to the otherwise scenic character of the river. The smokestack and power plant stand in stark contrast to the scenic and natural character of the Middle Fork. Photo by Pam Richart, Eco-Justice Collaborative. April 2016. Because Illinois does not have a coal ash rule and the federal rule does not apply to closed facilities, we need to exert pressure on public officials to make sure that the IEPA requires Dynegy to move its coal ash. State Senator Scott Bennett, State Representative Chad Hays, County Board Chair Mike Marron, and Danville’s Mayor Scott Eisenhauer can speak with Governor Rauner and IEPA Director Alec Messina, and insist that moving the coal ash out of the floodplain of Illinois’ only National Scenic River is the only way their constituents can be assured that the three coal ash pits won’t become a future liability for Vermilion County. 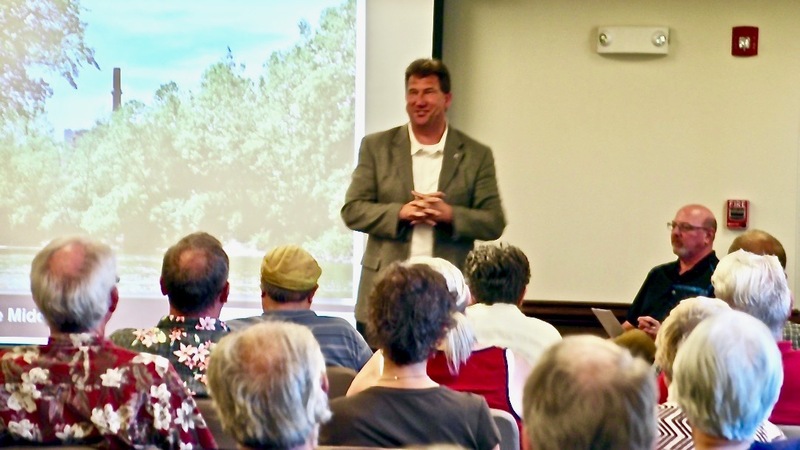 Danville’s Mayor Scott Eisenhauer speaks to a crowd of over 70 at a June 5, 2017 Town Hall organized by Eco-Justice Collaborative. Photo by Pam Richart, Eco-Justice Collaborative. Public pressure over the past 12 months is making a difference. Public meetings held to raise awareness in Vermilion and Champaign Counties have resulted in phone calls to elected officials; hundreds of letters to local and state officials; and over 500 letters to Governor Rauner and IEPA Director Alec Messina. At a June 5, 2017 Town Hall Meeting, Scott Eisenhauer, Mayor of Danville, said he supports moving the ash and believes now is the time to hold Dynegy accountable. State Representative Chad Hays told those who attended the meeting that moving the ash is the best option, and he and local officials have told the IEPA Director how serious a concern this is. He further noted that addressing the coal ash concerns responsibly is not only an environmental issue, but also a quality-of-life issue. Scott Bennet, also present at this June Town Hall, said he has received hundreds of letters this from constituents, and some out of his district, who are concerned about the issue. Because the IEPA has approved a schedule that could bring a decision by the end of 2018, the public has just over one year to increase the pressure placed on local and state officials, the Governor of Illinois, and the Director of the Illinois Environmental Protection Agency. Your voice is needed, and can be effective. Click here to join the Protect the Middle Fork Campaign! We’ll keep you informed about upcoming meetings, events, and actions you can take. Call State Rep. Chad Hays and State Sen. Scott Bennett. Click for a sample script. Call County Board Chairman Mike Marron and Mayor Scott Eisenhauer, City of Danville. Use the sample script provided above. Call the IEPA Director Alec Messina and Governor Rauner. Click for a sample script. Sign and send this letter to State Senator Scott Bennett, Representative Chad Hays Vermilion County Board Mike Marron, and Mayor Scott Eisenhauer. Let them know what your specific concerns are by personalizing the letter. Write a letter to the editor, using these FAQs as a guide. Click for a quick tutorial. Host a letter-writing “party”, using the FAQs as a guide. Help organize a meeting with your church, school, service club, or neighborhood group. We'll bring fact sheets, our video, slides, and make a 30-minute presentation. Contact us via this form if you are interested. Host an informational meeting at your home with your friends to raise awareness and engage others. It’s easy. We’ve created a guide for your use, and will provide you with videos, slides,letters and fact sheets. Share what you’ve learned about the threat of having coal ash stored in the floodplain of Illinois’ only National Scenic River on Facebook and Twitter.